Review to our Newsletter Archives. ENVIZTEC announces the availability of IHS Incident Management solutions as an expansion of the Operational Risk portfolio available from IHS Inc.
IHS enables comprehensive Incident Management that integrates root cause analysis with preventative measures so you can minimize disruptions and drive operational excellence. IHS software, content and expertise can help you identify and manage emerging trends in order to lower your organization's risks and costs - before the next incident occurs. IHS solutions collect and aggregate incident data so you can effectively address potential risks at any level of the organization - one or more facilities, across business units or enterprise-wide. The framework delivers on all aspects of the process by delivering tools which cater for Incident Reporting and Investigation; Root Cause Analysis; Corrective Actions; Audits & Observations resulting in Findings ; High-Value Learning Events and Enterprise Reporting as valuable elements which help leading organisations improve their operational excellence performance. Chevron Enhances Safety Culture with Enterprise-Wide Incident Analysis and Reporting System. Total Petrochemicals & Refining USA Enhances Management System Audits and Risk Assessments for Integration with Incident Reporting. IHS is a market leader in Operational Excellence and Risk Management solutions, helping organisations ensure compliance with regulations/standards and drive innovations that promote operational excellence. ENVIZTEC announces the availability of IHS GoldFire available from IHS Inc. IHS Goldfire is a robust decision engine allowing engineers, scientists, researchers and other technical professionals to connect, on-demand, to the content, insights and expertise needed in order to make informed decisions. Powered by a multi-patented semantic search engine, IHS Goldfire pinpoints relevant solutions buried in internal and external knowledge sources and transforms the underlying data into actionable intelligence. With IHS Goldfire, customers can access and leverage content across over 400 file types and 5 languages found in PLM, PDM and DMS repositories, shared drives, directories and libraries, personal folders, email, worldwide patent collections, scientific libraries, websites, and more. IHS Goldfire also connects technical professionals inside and outside the enterprise to one another – irrespective of location and in multiple languages - enabling idea sharing and collaborative problem solving. IHS Goldfire includes tools and methods to stimulate ideation, speed problem solving and accelerate the discovery of optimal solutions. Optimizing Decision-Making Across the Product Lifecycle Whitepaper. Shell Innovates the Biofuel Market With Marine Algae. Mahle Driving the Future Engines of Innovation. IHS Inc. (NYSE: IHS), a leading global source of critical information and insight, has announced it has been granted a new patent for the question-answering technology behind its award-winning IHS Goldfire software, used by companies to accelerate research and power innovation. Patent No. 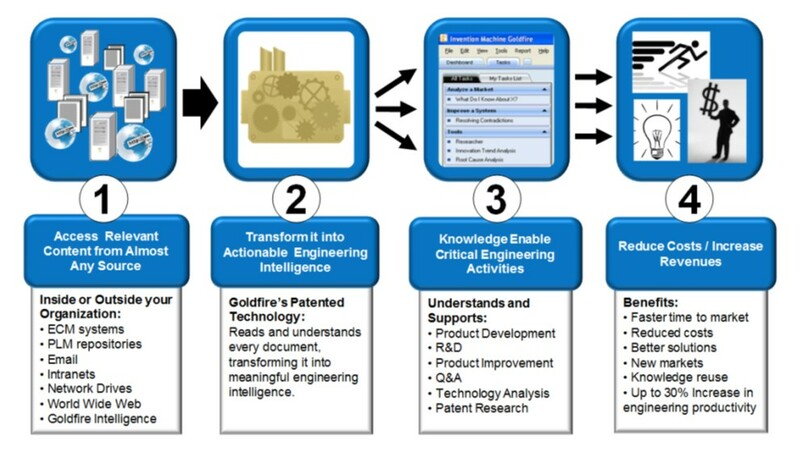 8,666,730, labeled “Question-Answering System and Method Based on Semantic Labeling of Text Documents and User Questions,” further extends more than two decades of leadership by IHS Goldfire in precision search technologies. The patent was issued by the United States Patent and Trademark Office on March 4, 2014 and is valid through March 2030. The patent covers the semantic concept “lenses” that IHS Goldfire use to accelerate research. The lenses correlate with the human knowledge system, organizing and presenting answers to engineers’ or scientists’ questions – even questions they did not think to ask. These lenses surface concepts in documents’ text, enabling users to rapidly explore a concept’s definitions, applications, advantages, disadvantages and more. To find out more... click here. IHS is a market leader in Product Design solutions, providing critical information and insight to help engineers and scientists drive innovation and achieve compliance worldwide. To unsubscribe to this newsletter please email enquiries@enviztec.com.au. All contents © EnVizTec Pty Ltd. All rights reserved.